The Meyerhoff Graduate Fellows Program began in 1996 with an MBRS-IMSD (Minority Biomedical Research Support – Initiative for Maximizing Student Diversity) grant from the National Institute of General Medical Science. The goal of the program is to increase diversity among students pursuing Ph.D. degrees in the biomedical and behavioral sciences. Now in its 16th year, the Meyerhoff Graduate Fellows Program attracts students from such institutions as Duke, Emory,Stanford and the University of Delaware. Supported by funding from MBRS-IMSD, the program is open to U.S. students and permanent residents from all cultures and backgrounds who are interested in the advancement of underrepresented groups in the biomedical and behavioral sciences. In 1996 two African American students applied to the Meyerhoff Graduate Fellowsprogram—one in chemistry and one in psychology. Three additional students applied in 1997. To increase awareness of the program and increase interest of underrepresented minority (URM) students in pursuing doctoral degrees, outreach efforts were initiated in 1997 and continue today. To date, 47 students have completed the PhD. There are currently 66 students in the program. These outreach efforts include the Summer Biomedical Training Program which consists of a 10-week research experience, a GRE prep course, mentoring by URM graduate students and faculty, presentation at a research fair, and other activities designed to prepare and motivate students to pursue Ph.D. degrees. Interest in the Summer Biomedical Training Program(Figure 1) has increased dramatically, up from 12 applicants in 1998 to approximately 100 applicants in 2008. 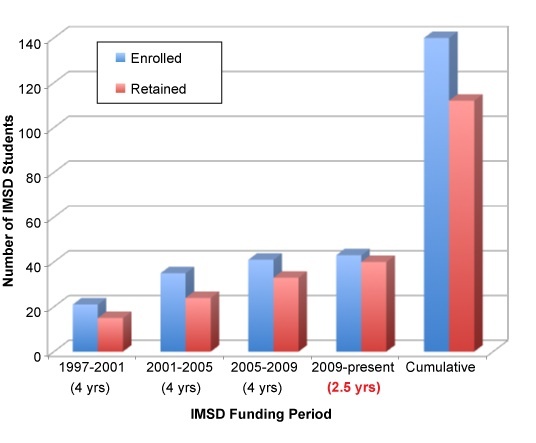 Due to these summer outreach efforts, interest in the biomedical Ph.D. program(Figure 2) also increased dramatically, up from three applicants in 1997 to more than 70 applicants in 2007. 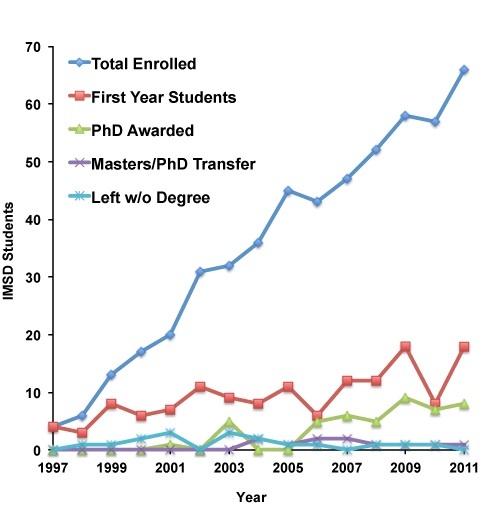 This has translated into a remarkable growth in URM participation in the biomedical Ph.D. programs at UMBC(Figures 3 and 4).Thus,URM participation in the Biology, Chemistry, Biochemistry, Biomedical Engineering, and Psychology programs at UMBC has increased from0%, 1%, 0%, 1% and 10%, respectively, prior to the Meyerhoff Graduate Fellows Program to current levels of 15%, 8%, 31, 8% and 15%, respectively. Considerable efforts are made to ensure that the Meyerhoff Graduate Fellows entering the program are successful. A Summer Bridge program precedes the first year of graduate school and is designed to improve preparation for graduate studies, build support networks, gain earlyresearch experience, and provide time for students to become acclimated to graduate school. 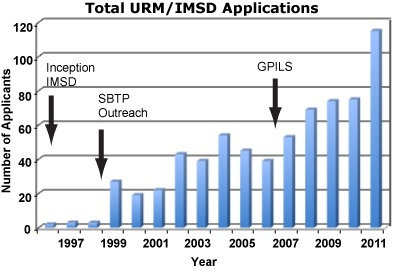 The retention rates of URM’s in most departments exceed 80% with the exception of Chemistry which has been addressed with the implementation the Chemistry Summer Bridge Program in 2004. (Figure 5) The 80% in all cases is higher than the departmental averages for all students and greatly exceeds the national average for URM students of about 50%.